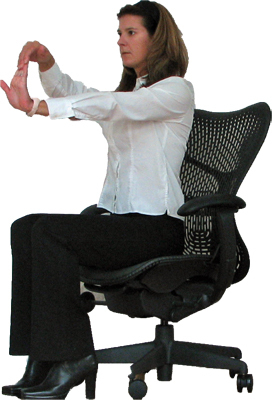 This is another dynamic-tension exercise that's perfect for the office, the car, or just about anywhere. Even simple and easy exercises like this increase your muscle tone and blood flow while helping build up the pectoral muscles. Place your hands in front of you at about breastbone level. Interlock your fingers. You can cup your hands and invert one, so they fit together comfortably. Alternately, you can link just your index and middle fingers like the links of a chain – this way is much better if you have long nails. Now, pull your two arms in opposite directions as hard as you can. Hold this pressure for five seconds. Relax for five seconds. Now, repeat.